Congratulations, you survived the December 21, 2012 Apocalypse! To celebrate life and the upcoming holiday, we’ve been thinking about what we want this year. Photo taken at Farmingdale Public Library, October 2012. As a frequent domestic and international flyer I have come to loath airline services. American companies have the audacity to charge its customers for everything (luggage, headphones, food etc) while providing us with nothing but a ride we’ve paid a substantial amount for. However, while customer service has gone down, in-flight entertainment has shown vast improvements. On a recent flight to Moscow, Aeroflot (reputedly having the worst customer service) had great individualized entertainment systems on each seat console. Customers can detach the remote control from the seat in front the them. One side acts as the tv control while the other side acts as the game controller. Although I loved this system, the older gentlemen next to me spent the entire 12 hour flight confusedly attempting to turn his tv on. Perhaps a redesign is needed to make the system universally usable. Once upon a time, a librarian princess was wandering lost in Williamsburg, Brooklyn. Just when she had given up all hope of ever finding the library, she stumbled upon the smallest library in the world. 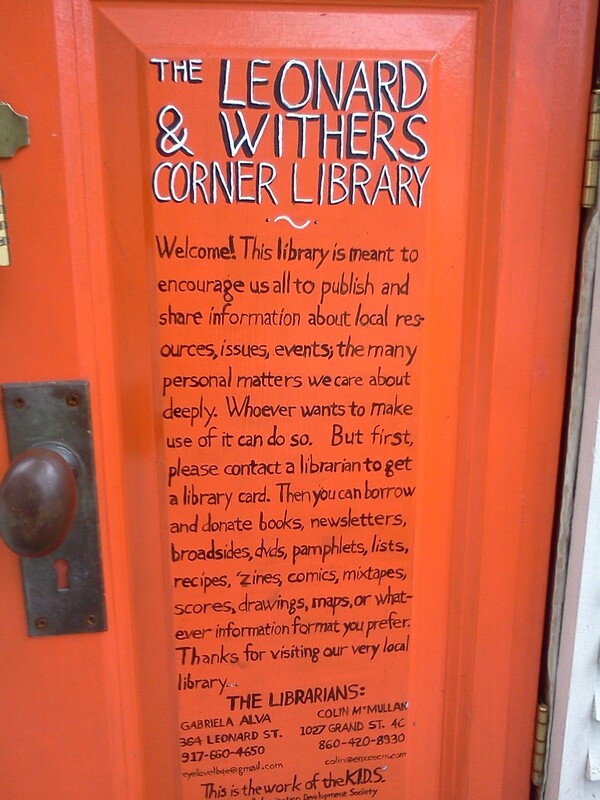 Located on the corner of Leonard and Withers, the Corner Library is open 24 hours with a lock code, which you can get from the project developer.